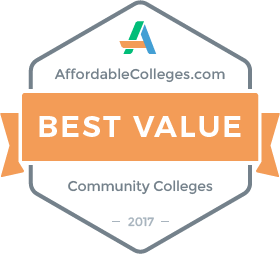 East Central Community College put a scare in the No. 7 team in the nation before the Hinds Community College Eagles pulled away in the second half for a 34-17 win Thursday, Oct. 12, at Joe Renfroe Stadium in Raymond. East Central stunned the Homecoming crowd on the Hinds campus by taking a 17-14 lead over the Eagles into the locker room at halftime. The Warriors jumped on top early, going 70 yards in eight plays on the opening drive of the game, capped by a nine-yard pass from freshman quarterback Mario Asagunla out of Hillcrest Christian in Jackson to sophomore wide receiver Antonio Gibson (Eagles Landing/Stockbridge, Ga.). The PAT failed and East Central led No. 7 Hinds 6-0. Following a pooch kick, the Eagles answered quickly, going just 50 yards in just six plays for the score. Running back DJ Sims scored from the 15 and the extra point gave Hinds the 7-6 lead still early in the first quarter. On East Central’s third possession of the game, quarterback Quentin Gibson (Archbishop Shaw/Marrero, La.) entered the football game for the first time since being injured in the opening game of the season. He promptly led the Warriors 76 yards in 12 plays for the score. Sophomore running back Dwayne Barnett out of Harrison Central scored from the one. Gibson then hit tight end Chris Deloach out of Columbus for the two-point conversion and the Warriors led 14-7. Midway through the second quarter, Hinds began a time-consuming 80-yard drive that took 14 plays and culminated in a six-yard run by DeVante Scott to tie the contest at 14-14. East Central would get the final points of the first half on a 22-yard field goal off the toe of freshman Zach Engell out of the Lamar School in Meridian. Sophomore running back Mikell Daniels out of Forest gained all 57 yards of the drive. The first half would end with the underdog Warriors leading the Eagles 17-14. East Central fumbled twice in its own territory in the first half, and twice held Hinds on 4th down plays in Warrior territory. The Eagles began to show why the pollsters think so highly of them in the third quarter, taking control of the game and holding East Central scoreless in the second half. On the Warriors first drive, defensive back Bryon Dewanye Galvin picked off an Asagunla pass and returned it 30 yards for the touchdown and the 21-17 Hinds lead. After exchanges of punts, Hinds found the end zone again, this time on a 20-yard scoring strike from Tylan Morton to Chris Blair, and just like that the Eagles led 28-17. The Eagles added field goals of 41 and 25 yards in the fourth quarter to push the final score to 34-17. 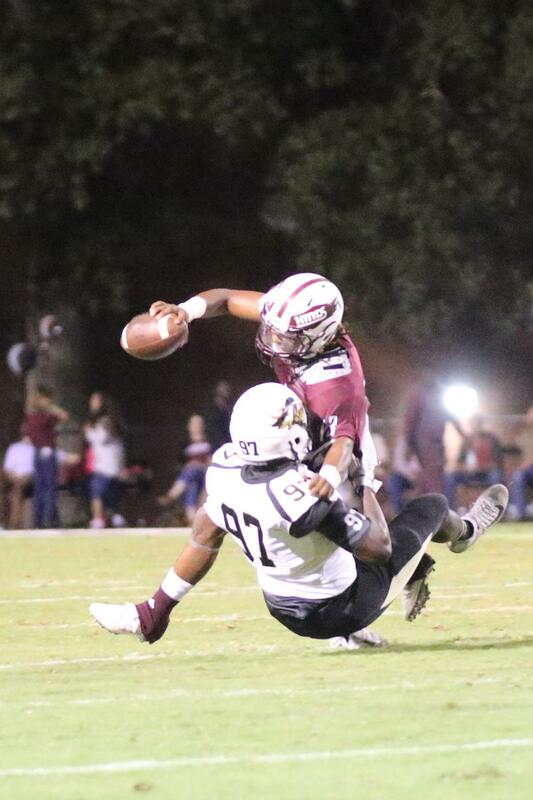 East Central managed 316 yards of total offense in the game, to 441 for Hinds. The Warriors turned the ball over four times on two fumbles and two interceptions. East Central, which had won the previous two meetings against Hinds, dropped to 1-6 on the season and 0-5 in MACJC South Division play. Hinds is 6-0 overall and 5-0 and atop the South Division standings. Six of East Central’s opponents have been ranked in the top 20 nationally at some point this season, and four have been ranked at the time the Warriors played them. 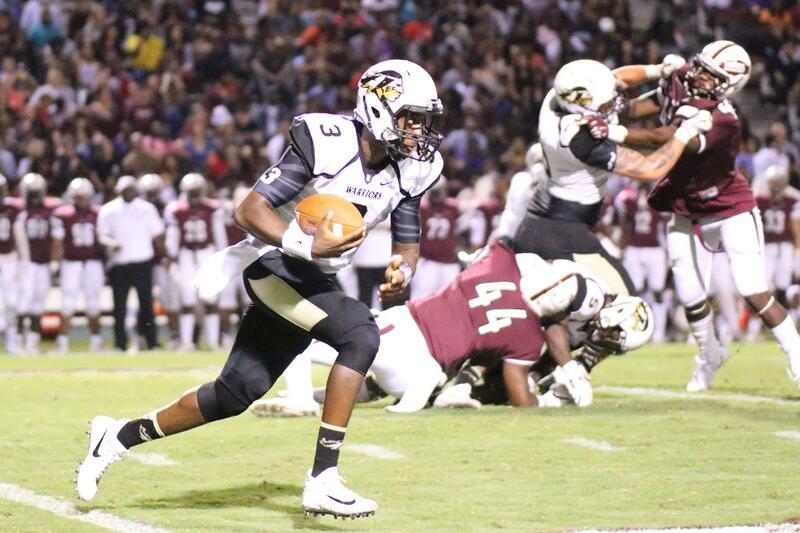 East Central will now return home for its final two football games of the year. The Warriors will host No. 10 Northwest Mississippi Community College Thursday, Oct. 19, at 6:30 p.m. at Bailey Stadium in Decatur. It will be Homecoming 2017 on the ECCC campus. The East Central vs. Northwest game can be heard on WKOZ 98.3 “The Groove” or via audio stream and live stream video at www.eccc.edu/eccc-media. 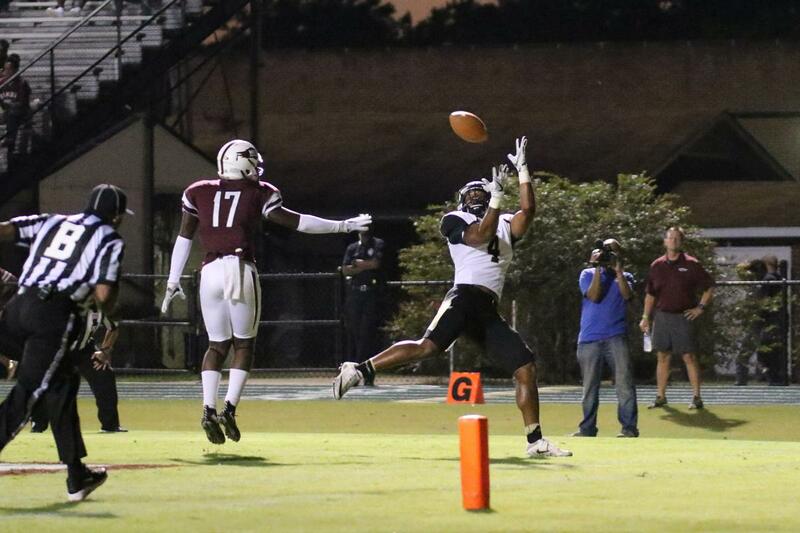 East Central quarterback Quentin Gibson calls his own number in the first half against Hinds. The sophomore saw his first action since suffering an injury in the opening game of the season. (EC Photo).